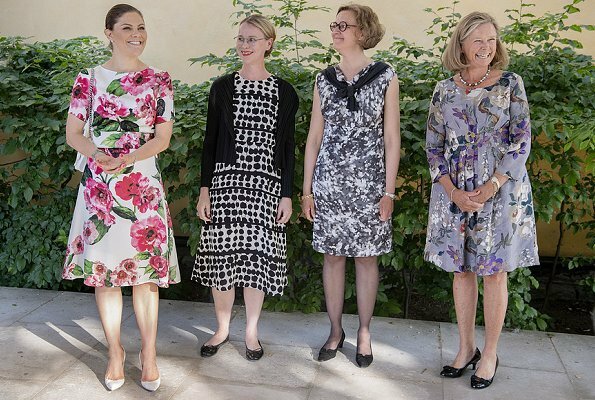 On May 29, 2018, Crown Princess Victoria of Sweden attended the annual meeting of the Friends of the National Museum (Nationalmusei Vänner), which was held at Moderna Museet in Stockholm. Crown Princess Victoria is the first honorary member of The Friends of the National Museum. The Friends of the National Museum was founded on 27 March 1911 by the then Crown Prince Gustav (VI) Adolf and Thorsten Laurin. I can't decide if I like It. Granny outfit? Nice flowery dress for this Visit,her Tradmark pulled back hairstyle with bun,every one knows her like that. But her smile is the best. I find it very annoying, how some people refer to a kind of style (they don't like) as Granny or grandmother style. Never thought about how very derogatory this is for all women who are not young any more? Never thought about the fact that you belittle grandmothers as women who completely lack style? Or do you think grandmothers have a special relationship with not only flowery gowns - but with ugly flowery gowns? This is not the first time I read something like this, of course. I cannot stop wondering why younger women hurt older women. Style is not something that goes down with age. Don't dress like that anymore. So its not a insult to older women. Calling a matronly style granny-style is not mean, if you ask me. It says nothing about anyone´s personality or worth, it´s only owing to the fact that grannies, or women of that age group, tend to dress that way (floaty, midi-length floral dresses) more often than younger women. It´s not claiming that every grandmother dresses like that, nor that every grandmother that does has bad taste. In fact, the point here is that something that is typical and age-appropriate for 60+ year olds makes someone at 40 look older, simply because the style is associated with older age. There ARE styles that suit various age groups, and it should be anyone´s aim to dress age-appropriately. That´s all. If someone at 40 dresses like a teenager, and that gets pointed out (because it doesn´t look right on a fully grown adult woman) doesn´t mean that one insults teenagers or teenager style clothing but rather the choice made by the 40 yo. I thought that Victoria´s latest floral number (the one she wore with the green shoes the other day) fell into the granny-style category (and therefore looked bad and almost costumy on her), but the above dress here is totally different. Yes, it has a floral print too, but it´s not the mille-fleur type that I associate with granny dresses. This is flattering: structured design, well-fitted, fresh colours, great print, good length, no frills. I find this very age-appropriate. And it´s super elegant too boot. I like it a lot! I totally agree with you Vanessa.on all points. People are just looking for an excuse to be offended these days. Some grandmothers dress quite stylish, especially these days when many stay physically fit and have healthy bodies. I think instead of using the label "granny", words like ill-fitted, too large, too long etc could better describe the clothing. My me "granny dressing" is something what was fashion or popular when (we) grannies were young. Nothing to say what grannies use today really. Vanessa, thank you for your explanation! I love this one, nothing granny in it, quite opposite, this one is very fresh. Totally agree with you, Anonymous (9:48 AM). I'm also closer to 70 than 60 and I wonder why label anything. Why not point out what's disliked instead of tacking a label on it? Besides, in the end it's what appeals to the person who's wearing it that counts. I agree with Vanessa, this print feels modern and fresh, as do the model. I love the fact that she has added sleeves compared to the original model. Nice Victoria! A lovely dress. Very summery and pretty. The colorful floral dress suits beautiful Princess Victoria of Sweden. I like this dress, its floral print looks great for spring and its style suits her. But her hair....sigh...again so flat and tightly pulled back. Why??? Is she afraid that no one will take her seriously if she shows up with more softer hairstyles? Doesn't she get headaches when she constantly pull her hair back tight like this?? Maybe it is the other way round. She has a lot of hair, heavy hair, very long hair, maybe she gets a headache with the hair wearing down, I did and feel so much better since I wear a super short pixie cut. I agree, and along the same lines, we should apply the same considerations when critiquing shoe style choices generally on this blog. Not everyone can wear heels or flats, wedges or stilettos or whatever, for a short while or an extended period, even though we think that may look better with their outfit. Back ache, hip problems, toe and arch issues, corns and bunions may all be factors that determine the shoe wearers choices that we might not know anything about (nor should we). When her hair are slicked flatly down to her scalp it doesn't look like she has too lots of hair. You can have your hair up and away from the way in more flattering ways, and with more volume at the top. Victoria's job isn't that straining-physical that she need her hair in tight ballerina bun. Why not get a haircut if she's having trouble with her long and heavy hair?? Love this dress. She often adds a feminine flair to her ensembles. As Crown Princess, perhaps she decided her hair pulled back is more professional and easier to maintain. I like the dress of Victoria, fresh and nice colored. All the 4 ladies in the pic look very nice. If you must have flowers, this is the way to do it! About the hair - it probably tends to be unruly, if left hanging, so when she works she wears it up so she doesn't have to worry about it.